I never get tired of pink! This is so beautiful I suddenly feel a CASE coming on! Beautiful card and color cominations. So pretty! 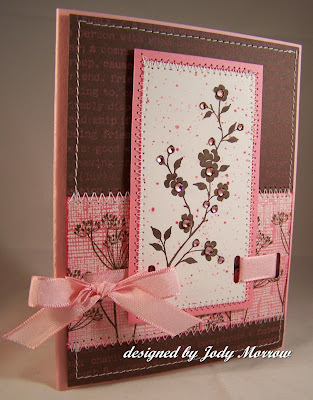 So pretty, pink & blingy, Jody -- love it! Love this flower as a cherry blossom! GASP! This is gorgeous, Jody!!! Love the stitching and the rhinestones!! Ohhh, I love this, personally I love all the pink on your blog lately! Love the crystals, I may just have to get me some since I love bling! Wow, Jody! These cards are awesome! I may have to try that emboss resist..very cute!!! Jody, this is so lovely! I haven't had chance to blog hop in a while, and yours is SO worth visiting!!! I love this card! Great color combo, great bling on the flowers, & I love the stitching too. Great job!